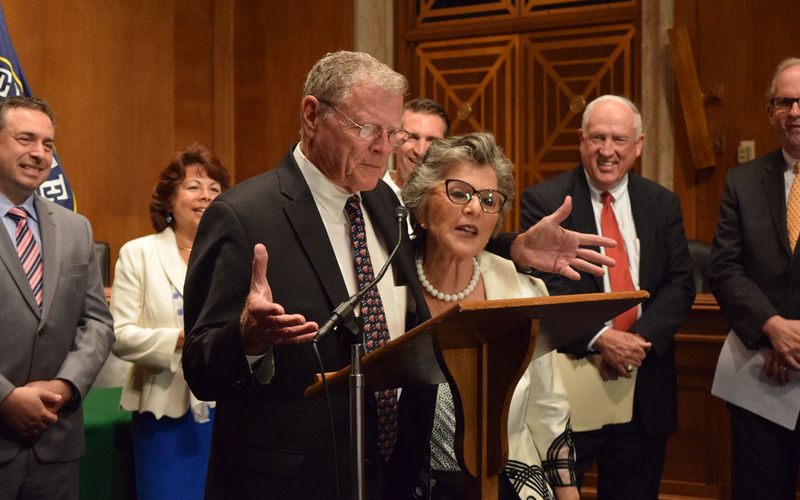 Though at odds on many issues, Sen. Jim Inhofe (R-Okla.) and Sen. Barbara Boxer (D-Calif.) say they can work together on transportation investment. ARTBA President and CEO Pete Ruane at right in red tie. Senate Environment and Public Works (EPW) Committee Chairman James Inhofe (R-Okla.), Committee Ranking Member Barbara Boxer (D-Calif.), and Senators David Vitter (R-La.) and Tom Carper (D-Del.) June 23 unveiled legislation that would significantly increase federal highway investment. The “Developing a Reliable and Innovative Vision for the Economy Act,” or DRIVE Act, would reauthorize the federal highway program for a six-year period, fiscal year 2016-21. The EPW Committee is scheduled to take up the measure June 24. The bill would not reauthorize the public transportation program or the highway safety programs—these programs are under the jurisdiction of separate Senate committees which have not yet scheduled action. More important, however, is the question of how to pay for the measure. This responsibility falls on the Senate Finance Committee, which held a Highway Trust Fund (HTF) hearing June 18 where its leaders committed to finding the resources for a long-term surface transportation bill. It is estimated the EPW plan would require additional $90 billion in HTF revenue over the next six years. This amount would bridge the annual shortfalls between incoming revenue and existing investment levels and fund the DRIVE Act’s investment increases. Additional resources will be needed to stabilize the public transportation program. While the reauthorization process will not move forward until Congress decides how to increase HTF revenue, the introduction of the DRIVE Act reinforces how quickly a bipartisan bill could move forward once that hurdle is overcome. Funding: It would invest $277.4 billion over the next six years—$32 billion more than would be achieved by maintaining current funding levels. About half of the proposed increase would finance two new programs proposed by the legislation, including $13.4 billion for a National Freight Program and $2.4 billion for a program of Assistance for Major Projects. The other half of the proposed increase would provide small annual increases in funding for the core highway programs established in MAP-21, which are continued with only small changes. Notably, the measure would cut Transportation Infrastructure Finance and Innovation Act (TIFIA) funding by nearly 33 percent from $1 billion to $675 million per year. The TIFIA Program provides loans and credit assistance to large transportation capital projects. ARTBA has supported the program since its inception in 1998 as a means to supplement core highway program funds. In 2014—before he became EPW chairman— Inhofe successfully added an amendment to the EPW highway reauthorization proposal that cut TIFIA funding by 25 percent. ARTBA will work to increase TIFIA funding as the reauthorization process moves forward. Annual authorizations by program and total funding levels are shown in the following table. National Freight Program. The DRIVE Act would transform the National Freight Policy provisions of MAP-21 into a new program that would fund freight-related highway improvements. The Federal Highway Administration (FHWA) estimates that $13.4 billion will go to this program over the six years. The Secretary of Transportation and the states would designate a national freight network comprised of Interstate Highways and other roads that are critical to the safe and efficient shipment of freight in the U.S. Program funds would be directed under national and state strategic plans to projects that improve highway freight transportation. Assistance to Major Projects Program. The bill would provide $2.4 billion over six years to help fund major highway improvement projects that exceed state funds available under the core highway programs. Eligible projects generally must cost the lesser of $350 million or 30 percent of a state’s annual federal highway funding, but no state may receive more than 20 percent of the annual total. Under the program, the FHWA Administrator would compile a list of eligible projects for submission to Congress each year, which would make the final selection. Creates a program providing funding to construct, reconstruct or rehabilitate nationally significant transportation facilities on federal or tribal lands, authorizing up to $150 million be appropriated each year out of general funds. 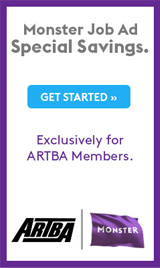 Directing DOT to allow for classes of CEs to be implemented through a programmatic approach—a key recommendation of ARTBA’s Trans 2020 Reauthorization Task Force. Despite being the least burdensome form of environmental review, CEs can take more than a year to complete. Using this strategy to treat CEs as a group rather than individually would reduce their approval time dramatically. Look for a more detailed review of the DRIVE Act in the Newsline later this week. Apportioned amounts are FHWA estimates. Other program amounts are from the DRIVE Act. Amounts for FY 2015 assume final authorizing legislation for the year will maintain funding for all programs at the FY 2014 level.